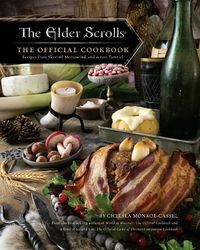 The Elder Scrolls: The Official Cookbook is, as the title states, an official cookbook for the series written by Chelsea Monroe-Cassel, the author of World of Warcraft: The Official Cookbook and co-author of A Feast of Ice and Fire: The Official Game of Thrones Companion Cookbook. The recipes are inspired by the food and lore that has appeared in the games. The text written in the Dragon Alphabet around the edge of the pages is the same excerpt of "Song of the Dragonborn" that was featured in the Gameinformer post that first revealed the alphabet. This page was last modified on 7 March 2019, at 22:47.